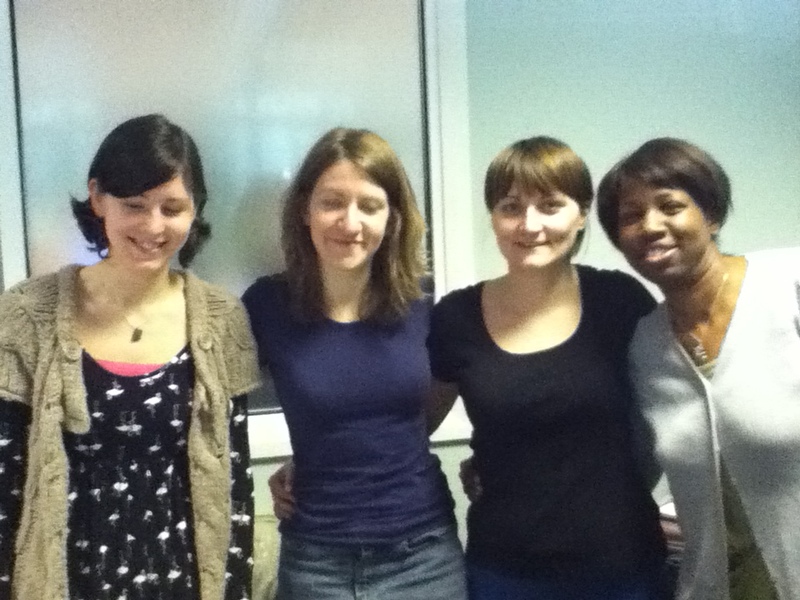 I recently took part in a creativity workshop at the University of Huddersfield. 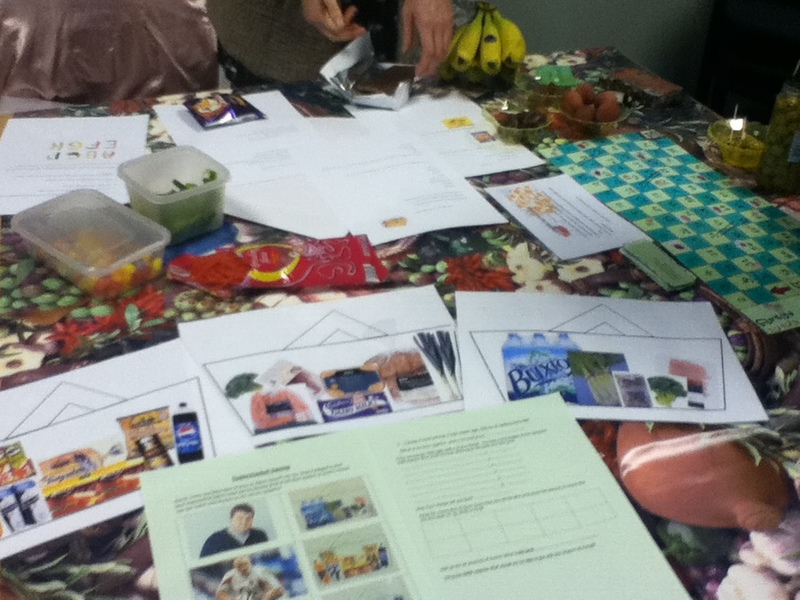 I was placed in the food group and we were given the task of producing a bank of creative numeracy, literacy and ESOL resources around the theme of food. We rose to the challenge and had a fantastic day showing off our home-made resources. As I’ve just started teaching numeracy to students aged 16+ I decided to create a maths related resource. I wanted to produce a worksheet related to my learners interests and as they are all teenagers and are interested in popular culture I was inspired by the idea of celebrity shoppers. It’s currently the RBS 6 Nations and as I teach in Leeds, a city where rugby is more important than football, I chose Mike Tindall as one of the shoppers as he is captaining England for this tournament. The other two celebrities are Cheryl Cole, as most of the learners are attracted to her, and James Corden as all of my learners share his sense of humour. For the first task the students have to match the shopping basket to the celebrity. The worksheet becomes progressively harder as the students need to use their ICT and numeracy skills to research the cost of the food contained in the shopping baskets and then add up the total amount. I like to embed life skills into my lessons so further tasks look at budgeting money as the learners to roll a money dice in order to produce a budget and then use Asda online to work out what they could afford and how much change they will get. If you would copy of the worksheet I produced it can be found by clicking on the following link. Using the internet research animal facts and write sentences about your findings. Use alliteration to tell your partner more about the animals – for example Leroy the lovely lion was lonely. Use one of the animals in your packet as a basis for a story. Think about the sizes of the animals and use for maths related activities. Make letters and words out of them. Make shapes – measure the perimeter and area of the shapes. Take a piece of food and try to guess which country it comes from. You can eat it if you want to. Imagine you are someone from that country. Write a piece about a day in their life. Use what you already know and the internet to research your piece. What have you found out about your country? Was the food fair trade or not? Use the internet to find out more about your country and fair trade. I made a game board to depict food as a game. I use the tomatoes which were squashed and were forfeit or dares. The eggs were fried eggs and they were forfeits or if you landed on these you would go back two places. I used ladders to moved the players on through the game quickly as if you landed on these you could go down the ladder. 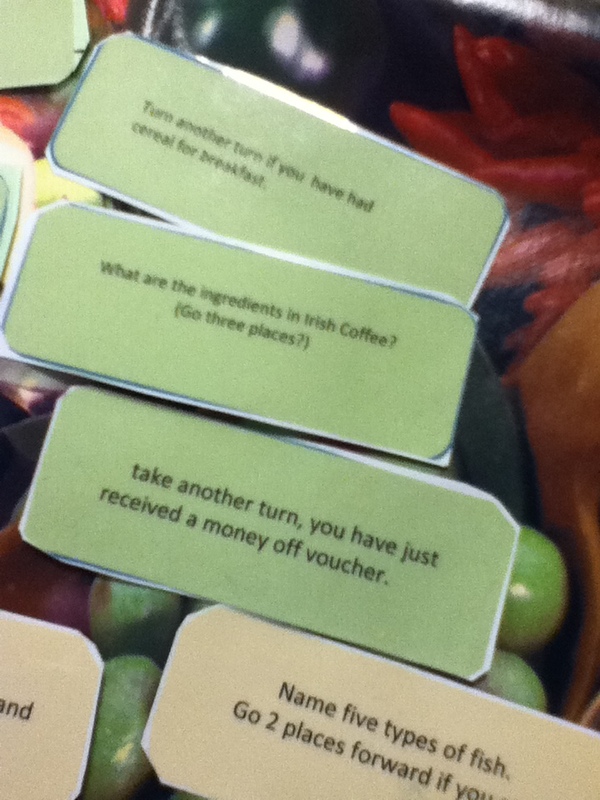 There were 15 hand-made forfeit cards which you took if you land on a tomatoes. I drew squares on a board and then coloured them in with contrasting colours in this case green and then added numbers up to 100. I made counters out of buttons and added two coins one silver and one bronze and the bottom I stuck on coloured tissue paper red and green to make them distinctive and added a dice. This entry was posted in PGCE, Resources and tagged ESOL, Food, Literacy, Numeracy, Resources by Gemma H. Bookmark the permalink. Love the slide show Gemma!